This is my final posting of my favorite small villages in Switzerland. Interlaken, between Lake Thun and Lake Brienz, is touristy with lots of diverse restaurants and hotels. Mürren sits high on a ledge and overlooks the Lauterbrunnen Valley. Traffic-free, it is quaint and picturesque with shops, eateries and hotels. 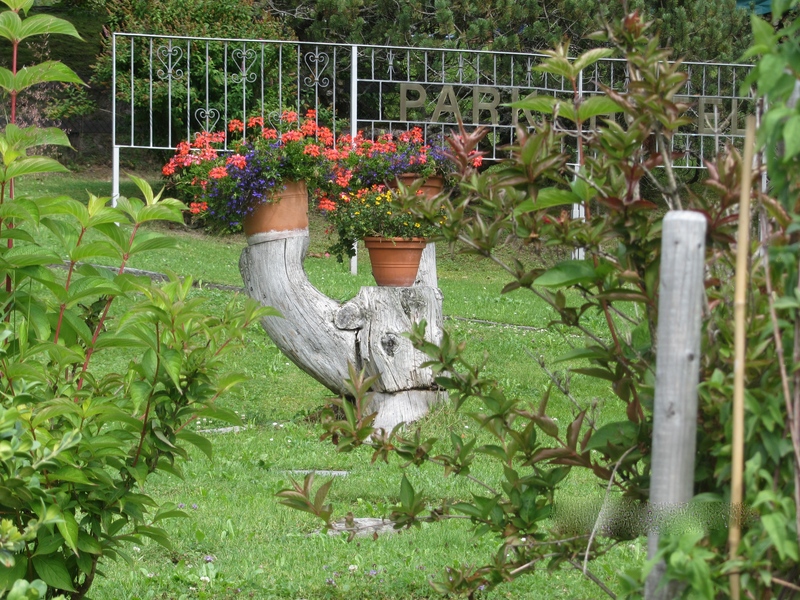 Gimmelwald is traffic-free, the smallest of the villages and one of a kind. 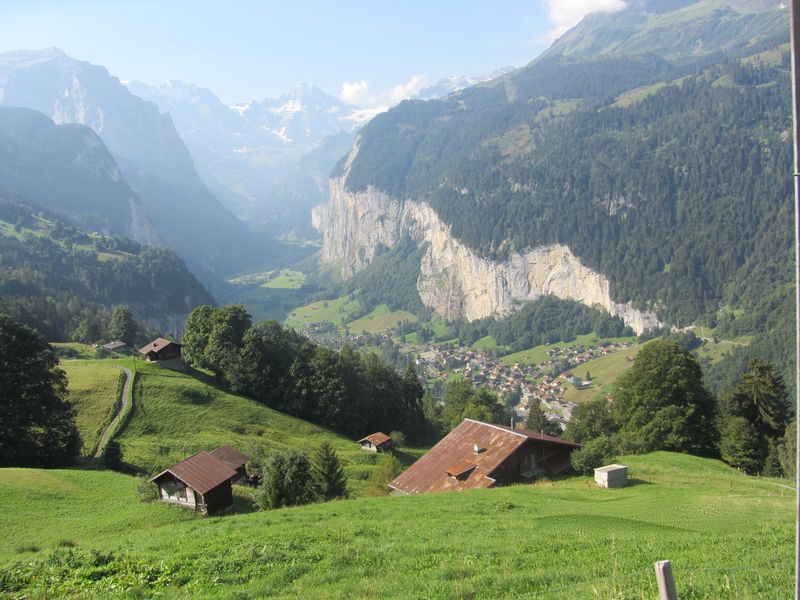 There are great walks and hikes from Gimmelwald, which makes it very popular with the hiking crowd. But, my favorite of all the villages is Wengen. 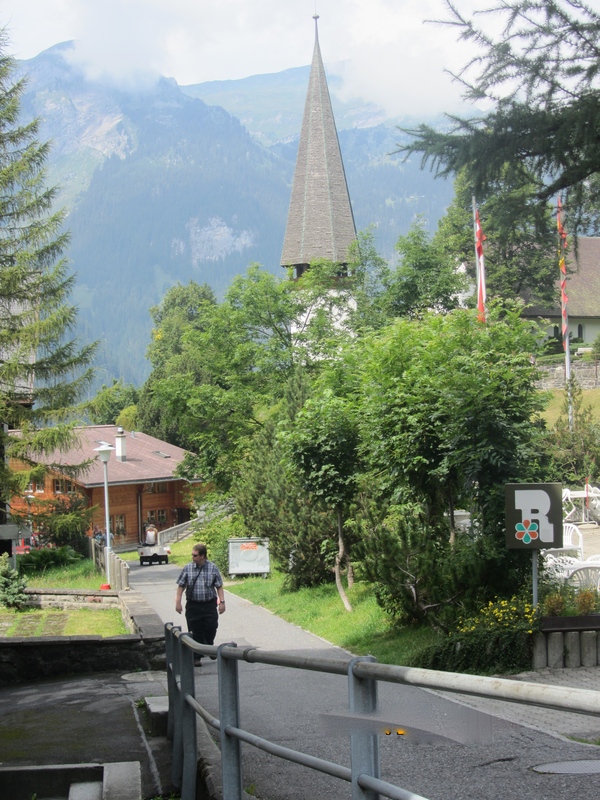 Wengen, population 1,300, swells to 5,000 in the summer months and 10,000 in the winter. It too is traffic-free and to get there from Interlaken you take the train to Lauterbrunnen, and switch trains to go further to Wengen. Arriving on the train we see women getting off and unloading large trolleys of groceries and staples to pull up to the chalets and hotels. 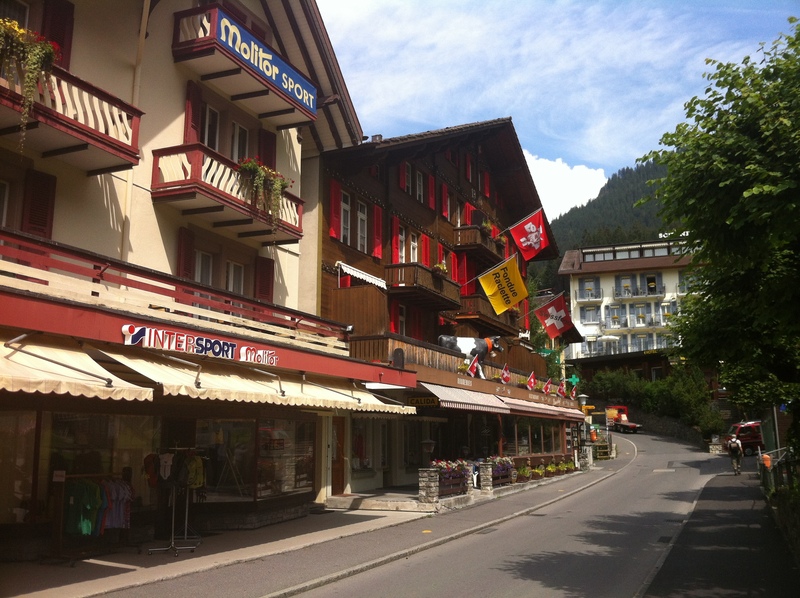 There is a small grocery shop in Wengen, but for supplies it must be easier to cart them from Interlaken. 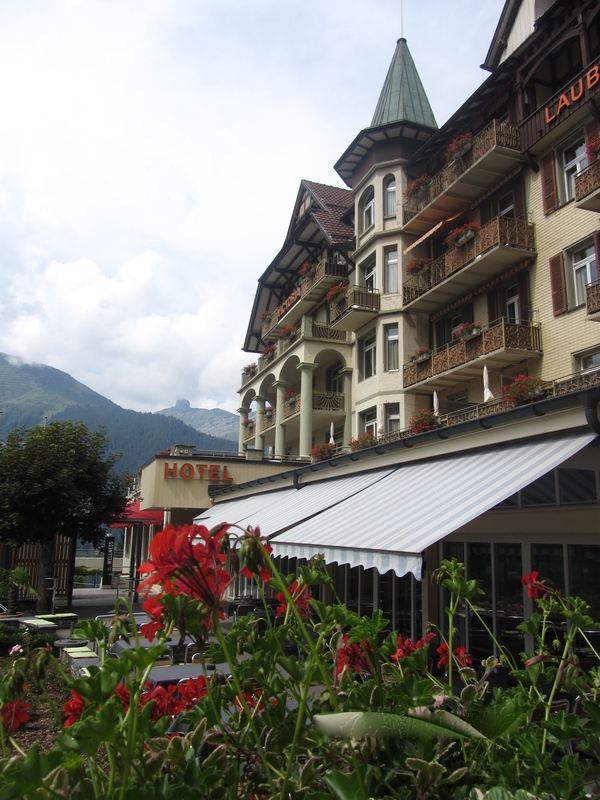 I took a tour of the Victoria-Lauberhorn Hotel and Spa. The rooms at the Victoria-Lauberhorn are on the small side, but have a fantastic view of the mountains and the spa facilities were relaxing and calming. There is a one street shopping area, with fine specialty shops for the nicer souvenirs. One shop features, crafted in Switzerland gifts only, and I bought a handmade coo-coo clock here and had it shipped home. There is also a very nice jewelry shop. 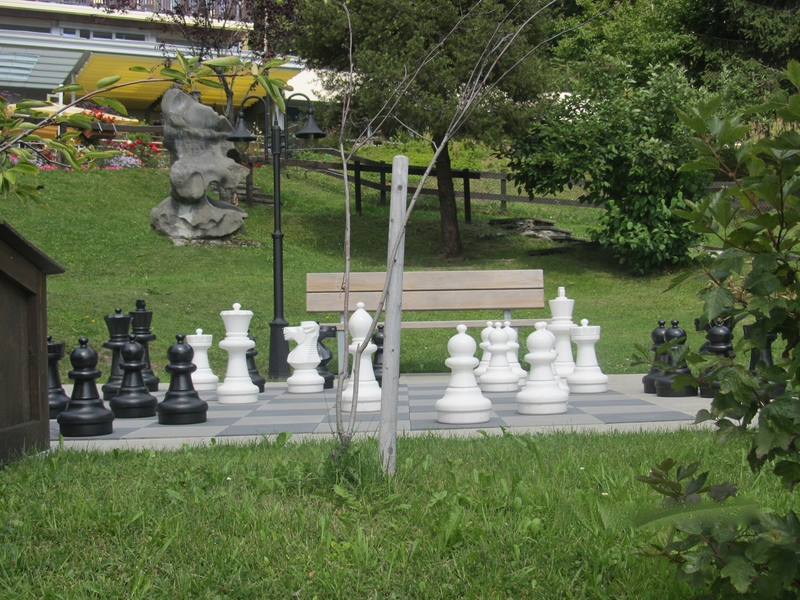 Walking through town there are large parks and huge chess sets. Benches are placed along side the sets so you watch how the match is going. There are also tennis courts and a pool in the upper park area past St Bernards English Church. The priest is available only in the summer months, since it is a rotating ministry. He was on sabbatical from the UK, but said the church was supported by the parish and held services most of the year, but sometimes without the priest. It was the same for the local Catholic Church as well. My highlight was the conversation I carried on with a German speaking woman, who invited me into her beautiful abundant flower garden. We got along just fine, mostly pointing and smiling. The loop walk through Wengen is just long enough to stretch your legs, mingle with the locals and enjoy every minute of your stay. My choice for a vacation in Switzerland would be Wengen. It is perfect! Be sure to watch the video to get an idea how beautiful it truly is!